The Blood Harvesters waited concealed among the trees until night fell, then began wading through the river towards the Daqan encampment. But as they reached the shore, they realized there was no need for them to attack. Three winged creatures were ravaging the camp, ripping apart tents, feasting on the hapless soldiers, and carrying their screaming, bleeding prey into the sky. 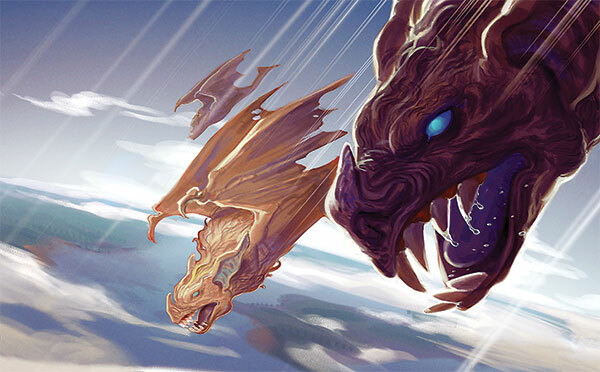 Hunt your enemies or hunt for cover as these fearsome predators take to the skies! 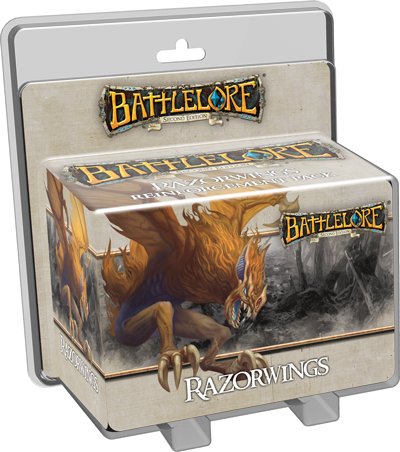 The Razorwings Reinforcement Pack for BattleLore Second Edition is now available at your local retailer and in our online store. These vicious, nocturnal creatures are too wild and untamable to belong to any faction, but you can deploy them alongside your Daqan, Uthuk Y’llan, or Undead forces and use them to terrorize your opponents from above. Inside the Razorwings Reinforcement Pack, you’ll find three detailed plastic figures and everything you need to muster this unit in your army, including new lore cards and a cavern terrain tile. You’ll also find a pre-built scenario that shows off the Razorwings’ unique abilities and offers tactical challenges unlike those of any scenario you’ve played before. The batlike, winged Razorwings tend to hide in daylight, but at night they bolt out of their lair and soar through the darkened sky, over forests, rivers, buildings and hill. No combat or movement restrictions limit these ravenous hunters in their search for unsuspecting prey. Once a target is found, the Razorwings plummet down upon the victim, tearing it apart with teeth and claws, then feeding until their hunger is satiated. With a Melee combat value of three, a unit of Razorwings can annihilate an enemy unit with a single attack. Then, immediately after they can stun an adjacent unit, marking out and paralyzing their next intended kill. The included pre-built scenario, A Shot in the Dark, gives you a chance to experience the rapacious speed and deadly attacks of these nocturnal beasts. 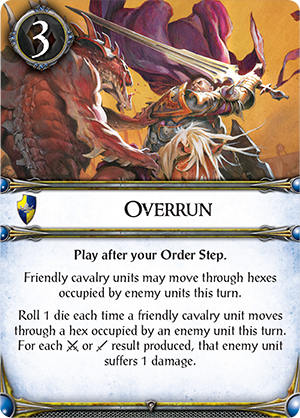 Unlike scenario cards, pre-built scenarios shape the entire battlefield. In A Shot in the Dark, the retreating remains of the Daqan army must traverse a battlefield bounded by rivers and filled with Razorwing-infested hills. Meanwhile, the Uthuk Y’llan take aim at them on both the left and right. The scenario alternates between day, when the Daqan can safely move forward, and night, when the Razorwings hunt and the Uthuk Y’llan attack, hidden in the conspiring darkness of night. You can learn more about this scenario in our Razorwings preview. 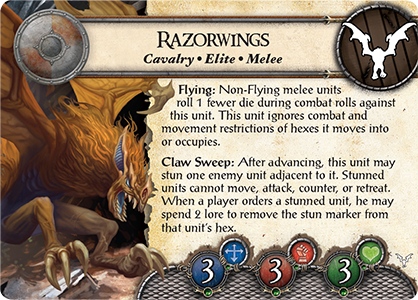 You can lure the Razorwings into your army for six gold and deploy them as you would any other unit. 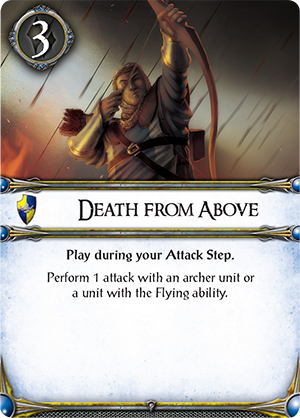 Then, you can substitute the three lore cards from the Reinforcement Pack for others in your lore deck – although since Razorwings are a Flying Cavalry unit, you’ll definitely want to keep cards like Overrun and Death from Above in hand. When you muster the Razorwings, you’ll also be able to replace a hill on your part of the board with a cavern hex to serve as their lair. 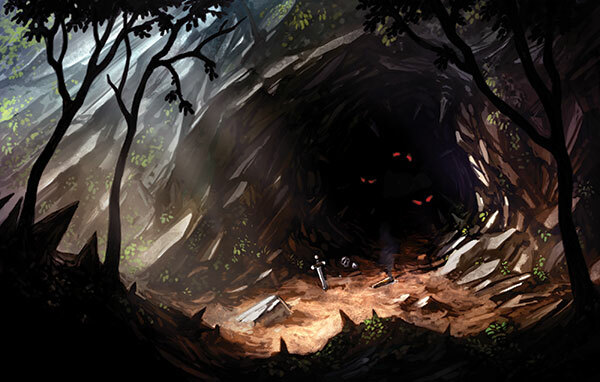 Then, during your Attack step, they may dart out, assault an enemy unit on an adjacent hex, and return to the dark cavern before the attack can be countered. Inside their cavern the Razorwings are safe from Ranged attacks, and sit eagerly waiting for their next chance to hunt. As commander of the Daqan, you might incorporate the Razorwings into a fast-moving, cavalry-heavy army of Riverwatch Riders and Citadel Guards from the Core Set and Citadel Lancers from Hernfar Guardians. You would be able to outpace, outflank, stun and trample your Uthuk Y’llan opponents. If you prefer to lead the Uthuk Y’llan, you might unite the flying Razorwings with Warband of Scorn’s Doombringer. Simultaneously soaring over and burrowing beneath difficult terrain, your forces could ambush the Daqan where they are most vulnerable. Or the predatory Razorwings might join forces with the restless armies of the Undead, and take the skies alongside a Barrow Wyrm dragon, or speed into enemy terrain with the ravenous wolflike Barghests and charging, vengeful Death Knights. No matter which faction you choose, it is much better to harness the Razorwings than to become their prey. If the Razorwings are fighting on your side, your opponents will tremble and cower at the fall of night. Yet the Razorwings are only the first wild creature to come to BattleLore Second Edition. Soon the Mountain Giant and Great Dragon will join in the fray, bringing incredible tactics and new scenarios with them. The Undead armies of Terrors of the Mists and Heralds of Dreadfall are also arising from their graves and marching to war, hungry to exact a terrible vengeance upon the living. 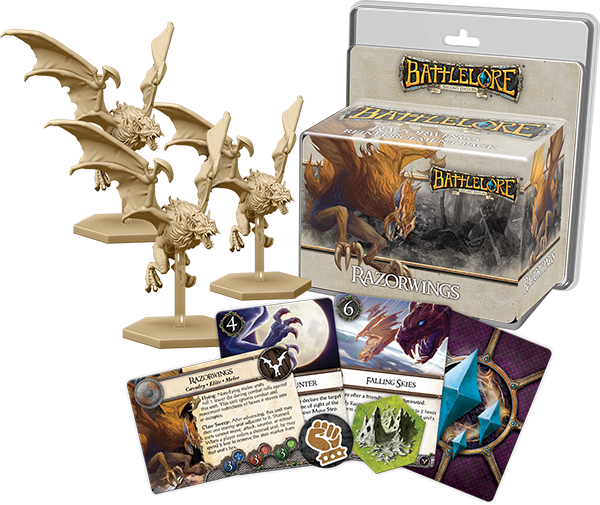 With so many new units taking the field, there has never been a better time to take up command in BattleLore. Pick up your copy of the Razorwings Reinforcement Pack from your local retailer today!